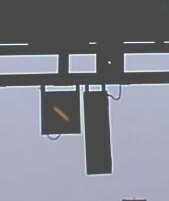 At the left rail you see a derailer connected to a box that can display either the Sh0: stop or Gsp 2: derailer off aspect. The box at the right is found often in DR area. 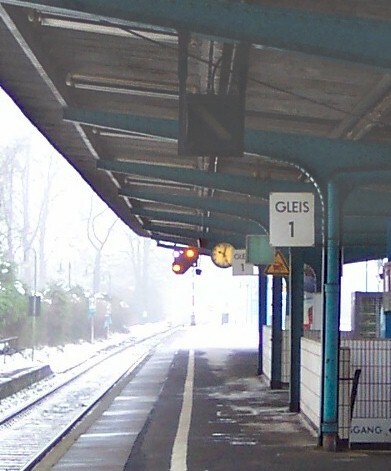 It combines a Ra 11a waiting board, a Kreisscheibe, and a Ra 12 signal in a W-Box. Note that the Kreisscheibe is obsolete now and may disappear in the future. Another Ra 11a/Ra 12/Kreisscheibe box. 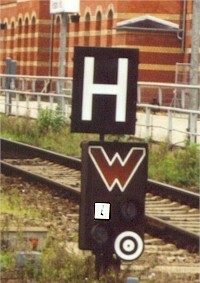 The black board on top is a Ne 5: Haltetafel (Stopping Marker Board): Halting trains stop here. 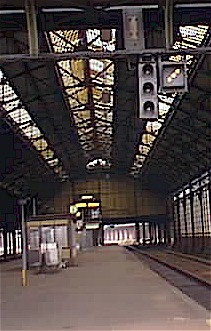 A Zp 8 signal at Rostock Hbf: brake test ok.
Another Zp 8 brake test signal and the rear side of a Fahrtanzeiger (proceed indicator) at Lübeck Hbf. The Front of the Fahrtanzeiger. 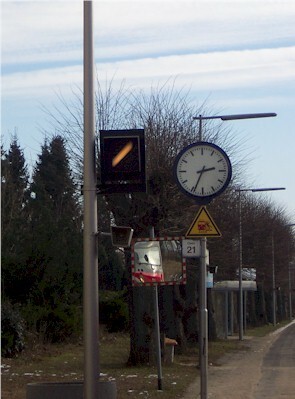 At Ahrensburg, a Fahrtanzeiger, then a distant signal repeater indicate whether the exit signal (the post of which you can see behind the distant signal) shows a proceed aspect. A light points signal. showing Wn 1 - straight. 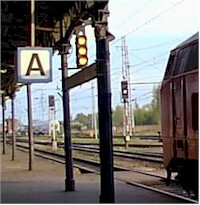 A train protection signal, usually used to separate a platform into two sections that can be occupied by different trains. 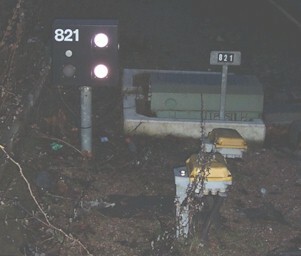 The signal can display either Sh 0 (stop for train and shunting movements) or the Kennlicht (marker light), which means that the signal is to be ignored. Note the white-red-white signal post plate on the full picture. This picture is by courtesy of Olaf Kerstiens.